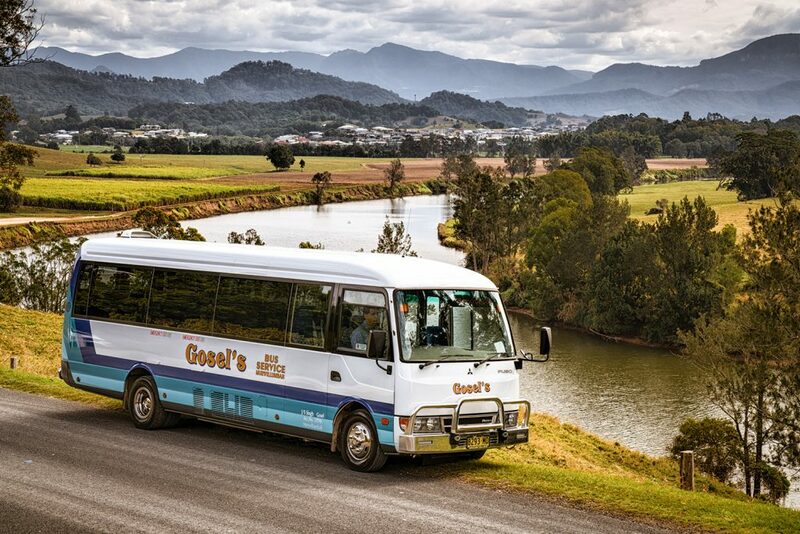 When I traveled to the Gold Coast to photograph Gosels Bus Lines, located in the stunning rolling hills of Stokers Siding near Murwillumbah, my lightweight Sony 4K camera and top of the range lenses allowed me to capture the full scope of images required for marketing, be it through print media or digital media as well as large billboard style adverts thanks to the 42MG file size of my Sony camera giving the client massive high res files for supreme clarity if required. Thanks to Qantas Airlines and their generous luggage weights, I was able to travel with my Vanguard camera carry case as well as an overnight suitcase. 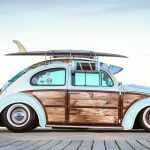 The only way to work with professional photography! 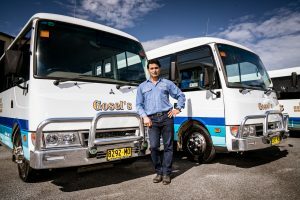 As time is always a factor due to the nature of the 24 hour transport business as well as cost effectiveness of the brief, we headed straight to Gosels and set up group pics with the fleet along with the Gosel family as well. With my background in professional portrait photography, the Gosels found posing for the camera relaxing and enjoyable, just as all posing should be. 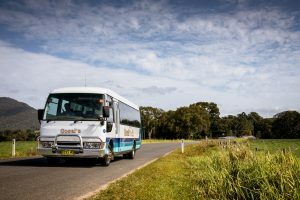 The picturesque backdrop of Stokers Siding lent itself well to eye catching creative photography while also keeping in touch the general bus routes these vehicles travel on a daily basis. Located in the shire of Tweed, the lush bush-land with its palm trees and beautiful tall gums contrast against one another in a stunning setting can create issues of mottled lighting but experience in creative flash lighting helps eliminate any harsh shadows caused by the low morning sunlight. The brand of the buses were the essential part of the brief so particular attention was paid to focusing on this when setting up shots. 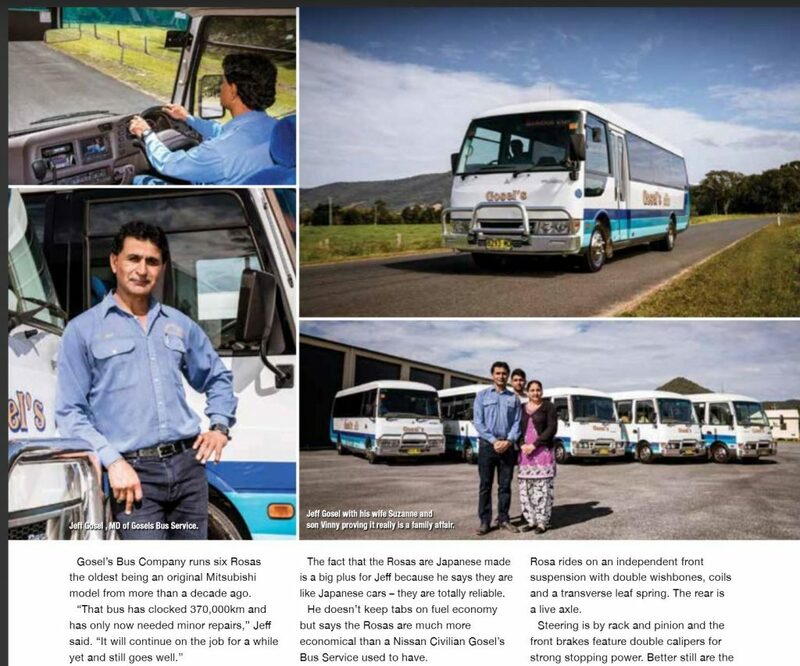 The Mitsubishi owned Fuso constructed buses are perfect for these small communities with their tight windy roads for school runs and community groups. 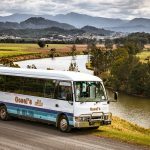 As can be seen in the leading pics, we sourced out suitable locations for attractive landscape images which could be easily utilized as hero shots with the right amount of negative space for the editors. 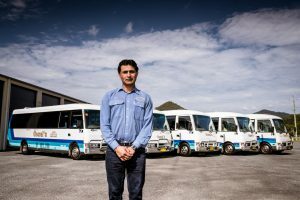 This shoot was completed easily within the day and of very little disruption to the bus service. 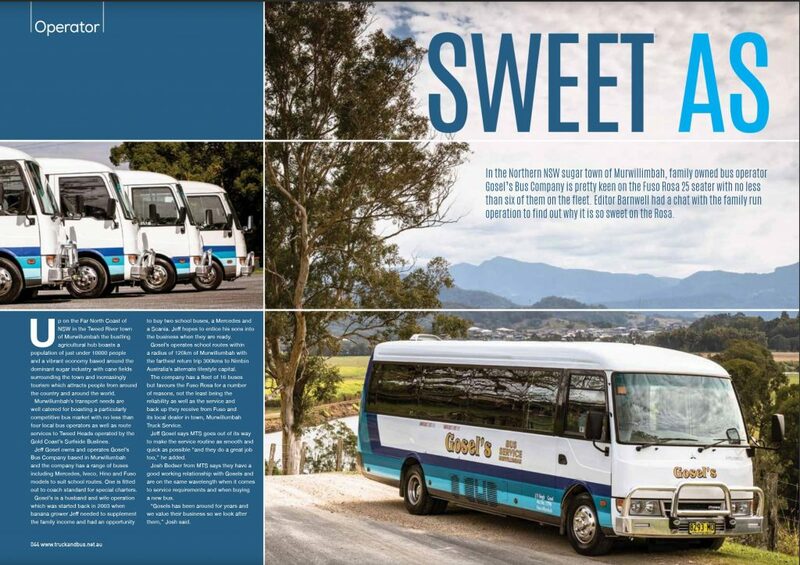 A variety images were supplied to the client and the results can be seen in numerous publications including Truck and Bus magazine as seen here thanks to professional photography! 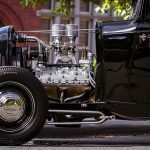 More on location photography stories: Photographing award winning stock crate in Hamilton, Victoria!